MACE Christened DeKalb’s New Superintendent Cheryl Atkinson & Baptized Board Members Tom Bowen, Eugene Walker, and Jay Cunningham; DeKalb OIR Chief Ronald B. Ramsey Also Sprinkled; Teachers Will Not Take Atkinson Seriously Until OIR Is Cleaned Up Or Razed; Is Atlanta Superintendent Erroll Davis Just Keeping House? | Georgia Teachers Speak Out! ← Looking At Six Metro Atlanta School Systems & Their Stresses and Strains! MACE Christened DeKalb’s New Superintendent Cheryl Atkinson & Baptized Board Members Tom Bowen, Eugene Walker, and Jay Cunningham; DeKalb OIR Chief Ronald B. Ramsey Also Sprinkled; Teachers Will Not Take Atkinson Seriously Until OIR Is Cleaned Up Or Razed; Is Atlanta Superintendent Erroll Davis Just Keeping House? 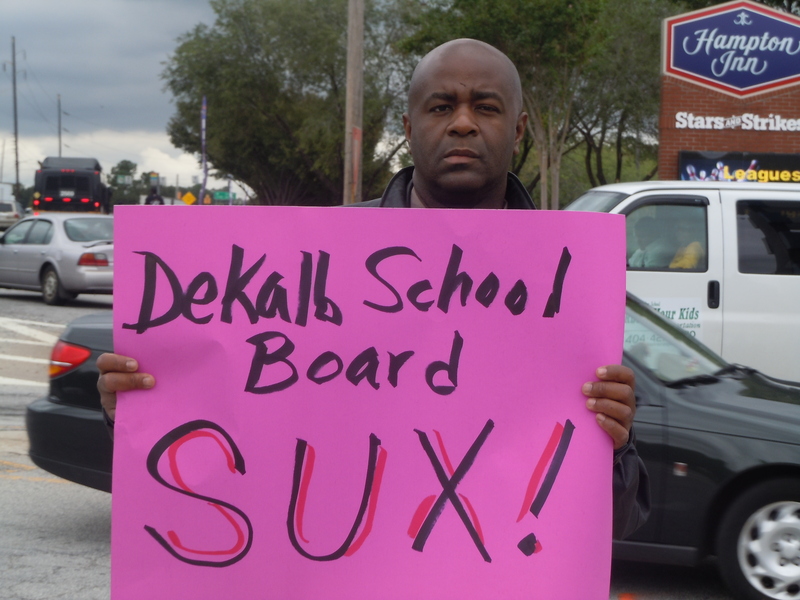 Don’t expect the people in DeKalb‘s so-called Office of Internal Resolutions (OIR) to even-handedly try to “resolve” matters. OIR is a tool of management to keep the teachers and other employees in line. OIR is one of the big problems in DeKalb County School System. That department needs to be razed, and I don’t think that teachers will believe that the Cheryl Atkinson Administration is serious about changing anything as long as the same folks are in control at OIR. It is a complete joke. It is headed up by State Senator Ronald B. Ramsey. I have always wondered how he can serve two masters. He is an elected official, but he is expected to put in a full day’s work, isn’t he? How does this happen? In his absence, he has folks running the OIR Office who don’t seem to know their butts from deep centerfield. Well…maybe not the whole school board…but those members who show little or no respect for their dissenting colleagues. I have told you guys on many occasions how Ronald Ramsey shut down a grievance BEFORE it even got started. No official explanation was given…except that he ridiculously claimed that the complainant had not offered “probative evidence.” Heck, Ronnie ole chap, the hearing had not even been started. The teacher had not even been heard. But, the Georgia Code states that “the complainant shall be entitled to an opportunity to be heard, to present relevant evidence, and to examine witnesses at each level” (O.C.G.A. 20-2-989.8). Tom Bowen, Eugene (Gene) Walker, and Jay Cunningham…Committed To Mediocrity? Hmm. No, what Ramsey apparently was afraid of was the fact that the teacher from Clarkston High whom I was representing was intent on testifying about systematic cheating and was requesting that OIR bring in the many witnesses whose names he provided. What other explanation can I draw? Yes, this happened. Mr. Norreese Haynes and I were sitting at the table. This unconscionable action back-fired, however. A few weeks later, the cheating scandal in the DeKalb County School System erupted in the media. Very embarrassing. Atherton Elementary and King High were all over the news. Quite embarrassing. Perhaps this was why the school system was digging in and didn’t allow the teacher to have his grievance hearing as he is “entitled” to (O.C.G.A. 20-2-989.8). I made my protest about this illegal activity very clear right there in the meeting room. And you know what? I presume that ole Josie Alexander, one of the school board attorneys, in her laughable letter to me, thought that she could shut us up and keep us off the streets. Ha! Nah. It didn’t work. Not at all. I am still talking about it, right? And we continued to picket about the bullying and the systematic cheating, right? 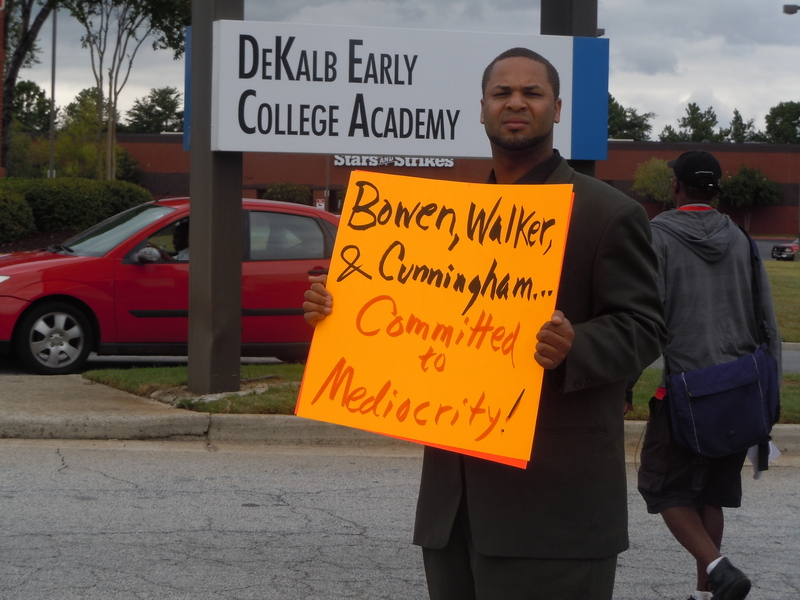 In fact, we engaged in three high-profile (covered on television) pickets three days in a row at the old DeKalb Central Office. We had “Systematic Cheating” and “Bullying” all over those signs. Respite after a long picket but effective picket…Tom (Thug) Berry (sitting) almost passed out. The orange juice and Snicker Bar seemed to bring him back to full force! Well, we saw who came out on top…in this illegal grievance shut-down, didn’t we? Just a short time later, the County and State raided Crawford Lewis‘s office. Ironically, we had had another picket lined up for Crawford on that very same day…but we had an emergency that came up in the Atlanta Public Schools. We had already purchased a clown suit at Party City, and Mr. Barnes was looking forward to donning this suit…to symbolically represent Crawford Lewis…that Clown of a Superintendent. Well…now that would have been just too funny! But, we still have the suit. If Cheryl Atkinson acts is some clownish ways as superintendent, perhaps we will dust off this clown suit and illustrate our point. Or, what about “Tommy (Bowen) the Clown“? Oh, how I do love engaging in legal protests. This is what our Founding Fathers envisioned. A country based on legal dissent. Not like the old U. S. S. R. under Stalin. Not like South Korea. Not like Kaddafi’s Libya. Just good ole dissent. But, I am telling my fellow bloggers who are disgusted with the ways of Eugene (Gene) Walker, Tom Bowen, Jay Cunningham, et al., that sometimes you have to move away from the keyboards and start organizing. 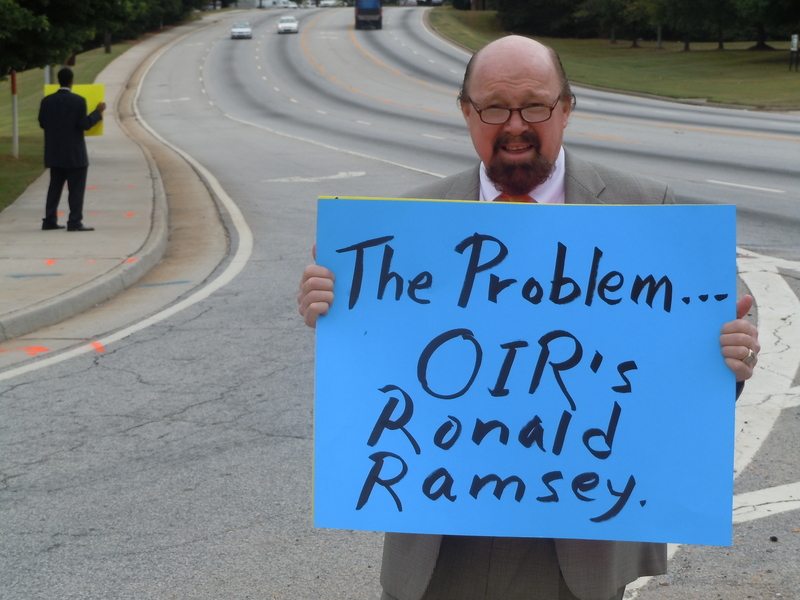 OIR or OIA or whatever it is called…Ronald Ramsey needs to properly do his job. He needs to process the grievances! I learned a lot from the Rev. Hosea Williams. He actually used to participate with MACE in dissent. “Six feet apart!” Ha! I remember a good juicy picket in front of 210 Pryor Street (the old Atlanta Central Office location). We had all four local news stations (Channels 2, 5, 11, and 46) there. That was a good picket! I remember when we met with Rev. Williams on a couple of occasions while dealing with some foolishness in Clayton County. I remember him speaking at the Clayton County Board of Education meeting. The school board and audience were so tense. You could have cut the tension with a knife. Then Rev. Williams told a joke on himself that immediately brought the entire house down with laughter! Even the superintendent was lined up after the meeting, requesting his autograph! I remember when Rev. Williams invited my MACE colleague, Dennis Yarbrough, and me to be with him on the Alley Pat Show. What a hoot! We could hardly believe how blunt Rev. Williams was when talking about the situation down in Clayton County. He was indeed a character, and I miss him! He hailed from East Lake, the same land owned by my Alston ancestors. Dr. King said that Hosea Williams had more raw courage than any man he knew. Enough said. Yes, we focused on DeKalb today. Christened the new DeKalb County superintendent, Cheryl Atkinson (who reminds me of a young Beverly Hall), with a good ole MACE picket and baptized board members Tom Bowen, Eugene (Gene) Walker, and Jay Cunningham too. 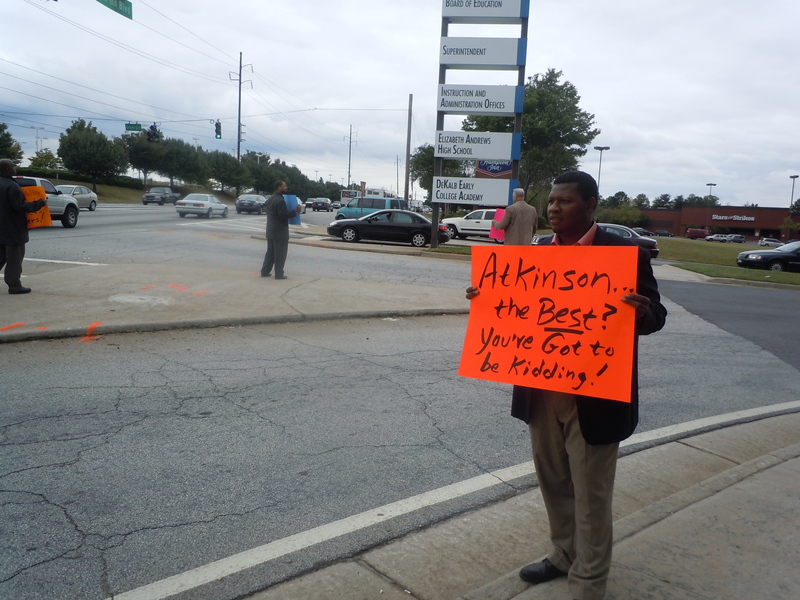 Also sprinkled Ronald B. Ramsey, the head of DeKalb’s Office of Internal Resolutions. He just needs to process the grievances, according to Georgia Law. He is, after all, a Georgia State Senator. Had a great time on the picket line, and the people seemed to enjoy it! This monstrosity of a headquarters out on Mountain Industrial Boulevard makes APS’s Taj Mahal on Trinity Avenue in Atlanta look like a little club house. Cheryl Atkinson was the “best” to choose from? You’ve got to be kidding! Give us a break! You have Dr. Sam King right next door in Rockdale County…Georgia’s Superintendent of the Year! Enough said. 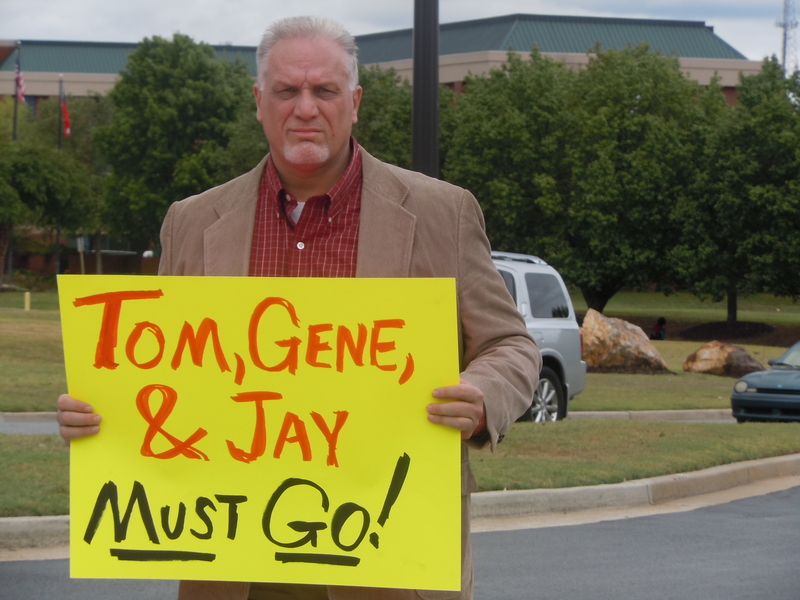 Tom Bowen, Eugene Walker, and Jay Cunningham…Committed To Mediocrity! They Must Go! Hey Brother Erroll Davis, it looks to me that you are just keeping house at APS. The discipline in the schools is still near non-existent. In fact, we dealt with a teacher tonight from Douglass High, the scene of many MACE pickets, grievances, and PSC Complaints in the past. Two recent principals resigned rather abruptly at this school. The teacher said that the retired principal who served as an interim principal was pretty good in discipline. But, the principal from DeKalb’s Columbia High is the current principal at Douglass. His name is Glanton. I remember us picketing him twice at Columbia. I suppose that we need to go to Hamilton Holmes Drive and get out the florescent-colored signs. Last time we picketed there was in the pouring down rain. It’s a good sidewalk. A nice Category One Free Speech Forum. Justice Thurgood Marshall: “What better place to picket than in front of a school?” I agree. I do love the U. S. Constitution! (c) MACE, September 7, 2011. 16 Responses to MACE Christened DeKalb’s New Superintendent Cheryl Atkinson & Baptized Board Members Tom Bowen, Eugene Walker, and Jay Cunningham; DeKalb OIR Chief Ronald B. Ramsey Also Sprinkled; Teachers Will Not Take Atkinson Seriously Until OIR Is Cleaned Up Or Razed; Is Atlanta Superintendent Erroll Davis Just Keeping House? “We shall overcome.” Our kids will get the first-rate educational opportunties they deserve if we “keep our eyes on the prize” in our efforts to dismantle the educratically controlled educational plantations extant in many GA school districts. Dr. Craig: As always, you have hit the nail right on the head! Let me know the next time you’re picketing at the Palace. I’d like to be with you and hold one of your signs. That would be a hoot and would surely make my day. CV: We will be glad to make you happy! Had a picket squad at Stone Mountain High School today with Channel 5 helicopter hovering up over the picket! That school hasn’t made AYP in years, from what I understand. I also understand that principal Carolyn Williams charges the students money to attend pep rallies! What?! Changes need to be made at that school. Dr. Cheryl Atkinson needs to do something about OIR/OIA under Ron Ramsey and do with Stone Mountain High School with all due alacrity! Have you connected with the people at Parents for DeKalb Schools? I think you might have had 100 people picketing with! I think you would have a lot in common. You can contact me via email if you have any questions or concerns. I am not in charge of the email group above just an educational activist. Thanks! We will be contacting you! Do you need a sign-carrier with a shaved head? Let me know when and where? Baptize Newton Co. super who pulled and held a senior’s diploma at Newotn High in May for bumping into his car accidentally in the parking lot before the ceremony. ABuse of power. @ LP: Did this really happen? If so, unbelievable! Yes. May 28th, 10 a.m. at Church in the Now in Conyers where they held graduation. SHe did not know what to do but did not understand what the accident and minor damage had to do with his high school diploma. The new super intendent would not let him have it until the minor damage was repaired. She said the principal was jsut sick about it but scared of the superintendent in Newton. We don’t think he would have done this to a family of better means. A realy misuse of power and not even in line with county discipline. The children of some folk seem to count more than the children of others. In my hometown, the children of the more academically accomplished, the more vocal anfd the “connected” attend 3 magnet schools, an IB program and two adequate elementary schools. The children of the remainder of the city’s school taxpayers attend about 3 dozen schools most of which are tragically substandard. Why does the majority of the parents in Augusta-Richmond County acquiesce in the RCBOE’s provision of substandard educational opportunities to their kids? It will take someone like John Trotter to make an example of this abuse of power against a high school senior over a silly parking lot accident. I hope he returns to Newton to christen the superintendnet and expose this. This mom has no voice against the system.